Earlier this year, the Hadassah Foundation ran two contests—a video contest and an essay contest--in honor of its "Chai" (18th) Year of grant making. Both contests—open only to high school students—asked them to address their aspirations as a young, Jewish, female leader in their community, and how they wanted to change or add to the world. The goal of the contests was to lift up the voices of the next generation of Jewish feminist leaders. The video winner, Tallulah Bark-Huss, from Chicago, IL, is now a freshman at Boston University. The Hadassah Foundation has arranged for her to have a one-on-one meeting via phone or videoconference with Amanda Lipitz, a Tony Award Broadway producer and documentary filmmaker. "I strive every day to be an empowered and motivated female leader in all aspects of my life, especially in the Jewish community," said Bark-Huss. "To be given a chance to speak my truth and show what it is that I believe a female Jewish leader encompasses is an amazing feeling." The essay contest winner, Amanda Powers, from Newton, MA, is now a freshman at Harvard University. The Hadassah Foundation has arranged for her to have a one-on-one meeting via phone or videoconference with noted author Anita Diamant. "My identity as a Jewish woman has always been central to my drive and passion for making the world a better place, so I am incredibly grateful to be acknowledged by a foundation doing such amazing work to lift up Jewish women around the world," said Powers. You can read the essay and watch the video here. Congrats to our grantee, Microfy! 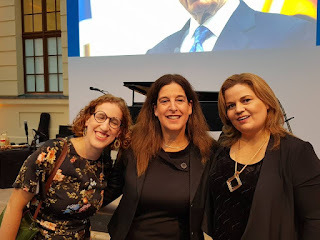 They won the first-ever Shimon Peres Prize through the Israeli Deutsche Future Forum Foundation for their joint project with Migration Hub Network, an organization that supports local efforts worldwide that help migrant populations. Microfy was cited for its work with Eritrean women in Tel Aviv. Above, Microfy's former and current co-directors are pictured receiving the Prize at a ceremony last week at the Jewish Museum in Berlin.